What are the limitations of the recent years’ strike mobilisations? Is it possible to go beyond their deadlocks by building a different strategy? Can we link the struggles that have been emerging recently? Can community and labor struggles be linked and in which direction is it possible to achieve a transcendence of the multi-fragmentation that characterizes them? What is the potential and the weaknesses of political forms and what is their relationship with the struggles? Much ink has been spilled over the question of the general strike. This ink has been mixed with the tears from police gas and the blood of demonstrators to paint the canvas of recent years‘ strike mobilisations. The cycle of massive and militant general strikes which started in May ’10, peaked in the summer of ’11 and continued up until November ’12, included a series of peaks of diffuse social rage and triggered a series of political discussions about the «before» and the «after» of these peaks. The critique of the general strike is not new. In this text we will try to make it specific – to show its contradictions, possibilities and limitations as they are produced by this period’s experiences of struggle in the streets, in the workplaces, in the neighborhoods. The traditional critique of the general strike mainly covered three of its characteristics, all present in union bureaucracy (GSEE / ADEDY unions): its fragmentariness, its role as a pressure relief valve and the class-betraying nature of union leadership. In short, this critique claimed that general strikes were called for «from the top down» and without any substantial involvement by the strikers, they didn’t pose questions about duration and subversion, they manipulated workers’ struggles and defused the «people’s rage«. Against all these, the movement milieu usually argued for autonomous struggles and supported the slogan of general (political) long-lasting strike. Although typically valid, for us this critique remains abstract in many of its aspects. That’s because it focuses only on the «general» characteristics of the general strike and not its specific role in each cycle of mobilizations, assumes a completely linear and over-simplified relationship between the union bureaucracy and the «rank-and-file» and tends to ignore (or artfully overlook) the weakness of the movement to pose the question of general strike in autonomous political terms. Let’s raise some more questions. Are the calls for strike the same thing before and after the crisis? Is a call for a general strike during a boom of the movement the same as a strike called when there are no struggles? Does GSEE represent actual labor communities so that to manipulate or defuse them? What is, in any particular instance, the «people’s rage«, the real expectations and desires that GSEE defuses? Are the general strikes organised in a real way? Is preparatory political work made in the workplaces, either from the bureaucracy or from the grassroots unions? Can workers’ struggles link with each other through other ways «in the here and now»? Does the movement have the ability to establish a long-term strategy in the workplaces, let alone talk about indefinite strike in realistic terms? We are not saying that we have the answer to all these questions. We want to share some provisional conclusions on the historical character of the general strike during these last few years. To see what was its role and relationship with the movement, what is the class composition and the political aspirations of the strikers and how we have to reconsider its limitations. During the recent months’ strike mobilisations, and especially in the two-day strike of 6 and 7 November, there seemed to be a widespread disappointment among the people that participated. Even without examining them in terms of participation, the fighting spirit and the sense of the political stakes were in recession – both in the «militant» parts of the movement and the protesters that are not politically organized. The majority of the demonstrators just needed an excuse (few chemicals or rain) to start leaving Syntagma Square, and the standard low–intensity stone-throwing “rioting” intensified this feeling of movement routine. Of course it is well known that this kind of frustration didn’t occur suddenly. Most general strikes were called in view of the voting of new austerity measures and usually peaked during the day of voting. The majority of the protesters marched with the expectation to annul the measures, or at least with the hope that the measures can be canceled. But despite the massive demonstrations, the severity of the conflicts and the frequently insurrectional atmosphere, the measures kept getting voted, and people went home gambling on the next battle. This contradictory – almost schizophrenic – experience, this Great Night they all waited for and never came, is the highlight and limitation of the general strike. The mentality of the Great Night, the one massive and militant protest that would cancel the government’s austerity measures, developed as a consequence of the character of general strike itself, from 2010 and onwards. The new class composition resulting from the huge increase in unemployment, the collapse of the middle class and the universalization of precarious working conditions is very much in line with the class composition of strikers. Generally speaking, on the one hand we had the significant presence of the subject that lingers among the university, precarity and unemployment, and on the other hand the public sector workers and unions who see all their conquests and rights getting directly targeted. The «formal» employee participation rate in the strikes remained low, despite the massive demonstrations, since in private sector workplaces the word «strike» is nearly forbidden. The stakes of every general strike was the certain day and time of voting the austerity measures. Let‘s not forget that the social explosion of Sunday, February 12 came after two days of tepid demonstrations that very few people participated in. Thus, general strikes didn’t appear so much as the traditional paradigm of «stopping production» but more as rage explosions of the exploited and oppressed. We believe that this constituted an transcendence of the fragmentary or symbolic nature of previous years’ general strikes. Each «rendezvous» with the government offered a sense of political stakes to the demonstrators. It was this mentality that gave birth to the decisive and militant demonstrations, that made people clash for hours with the police, not leave the street, build solidarity and sharing relations, retreat, regroup, reattack. Many people came down to the street for the first time and believed in the collective power that emerged at that time – namely that they can block big political decisions. This political character of general strikes, diffused on social composition and specific in terms of the people’s objectives, strengthened and peaked through the central role that grassroots forms of struggle played – first the general assembly of Syntagma Square and then the popular assemblies in the squares of many neighborhoods. Despite their contradictions and problems, the way that these forms were associated with the calls for strike was critical for the outcome in the streets. 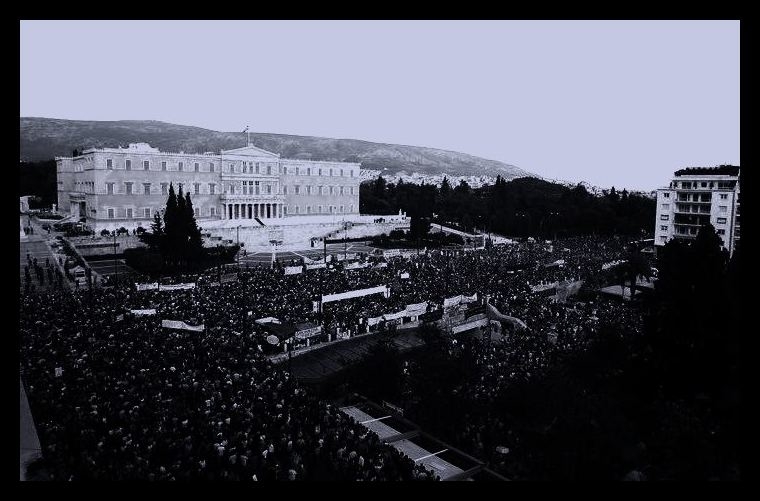 Both the Syntagma Square assembly and the neighborhood assemblies were an advantageous public space and time where political issues were discussed, solidarity and trusting relations were built and the militant presence of people in the streets was prepared in a material way. It was a point of reference and a starting base of struggle for countless fighting people. For example, in June 2011, the «occupied» Syntagma Square (ie the fact that there were daily assemblies with thousands of participants in the square) was crucial for the militant protesters’ organisation against the attacks of the police. On the other hand, the pre-demonstrations/marches that took place in the neighborhoods carried the strike atmosphere in many neighborhoods of Athens and played an important role in the confrontational and massive character of central rendezvous, such as the weekend of June 28-29 (when people attempted to blockade the Parliament) and February 12 (when the neighborhood assemblies’ roadblocks became a key reference point in the flaming streets of downtown Athens). What was, then, the meaning of the central rendezvous? What was the logic of the Great Night? As already mentioned, the majority of the people expected, explicitly or not, that their massive and combative presence in the street will overturn the measures, or even the government itself. The symbolism was ubiquitous. The helicopters will help MPs escape, the gallows were ready (in case they don’t manage to leave), the «Argentinazo memories», the «everyone leave» slogan. This is, after all, the common component of the experiences of people that came down to the streets in massive numbers recently: a Great Night that will bring a New Day. The accumulated frustration after the austerity measures were voted each and every time was leading to a dead end and was showing the limitations of these central rendezvous. We do not mean to scorn the political meaning of the general strike, but rather show the failure of the Great Night logic. The cycle of this period’s mobilisations and the expectation of the Great Night contain, in fact, a more or less mainstream interpretation of the capitalist crisis: that the crisis is a matter of central decisions of political power. Let us explain ourselves. A large part of the people who protested, aided of course by the leftist ideology, perceived the consequences of the capitalist crisis in their everyday life as an issue of central political decisions. In short, they felt that blocking the particular austerity measures will bring an end to the crisis. That if the government gets pressured and does not vote for the measures (or if it resigns and is replaced by a government that does not want to vote them…), the crisis will disappear as if by magic. So, although the material consequences of the capitalist crisis were becoming more apparent every day, the people’s response remained (and remains) abstract. And every time the expectation of that Great Night is canceled or postponed, the collective morale of the exploited crashes down. Obviously, the crisis issue is a political one. It is a matter of constant antagonism between the exploiters and the exploited – it is a matter of class war. The battles of this war are given daily in the fields of production and reproduction, in workplaces and neighborhoods, where communities of solidarity and struggle are formed. The possibilities that emerge from these fields, where the struggles are specific and based on everyday needs, illustrate the limits of the general strike and pose the question of linking different forms of social resistance on a new level. Despite big strike demonstrations being in recession, a wave of labor struggles in different workplaces, is observed. Many of these struggles emerge in places with little tradition in militant mobilizations, and they often exhibit autonomous political characteristics. Although the people involved in such struggles often have little or no “movement experience”, we see them organizing non-hierarchically, demonstrating militant characteristics. In some cases, workers “divert” traditional industry or business unions in more radical directions, while in places where unions are absent, they form autonomous communities, in order to fight. Grassroot assemblies, repeated and long-lasting strikes as well as occupations take place, even in workplaces where exhausting, underpaid exploitation and precarious working conditions are dominant. During the recent period, such struggles have sprung up in various private sector’s galleys (like Phonemarketing, Hol, IKEA or Metropolis), in municipalities or neighborhoods around the country (with demonstrations of both permanent and precarious workers in municipalities, and the rented by NGOs ‘community service programs’ workers), in universities (such as AUTH’s contractor employees’ struggle or Athens University’s and Aegean University’s contract workers’ demonstrations) and factories (with the occupations of factories like BIOMET and Fintexport). We suspect that there are more such “small” workers’ struggles that we haven’t heard of, since the lack of more ‘politicized’ peope participating in them does not facilitate the circulation of their experiences within the movement milieu. At the center of these struggles usually lies the issue of wages, the withdrawal or prevention of layoffs and the resistance to further intensification and precarisation of labor. How do these mobilizations relate to the bureaucratic trade unions of GSEE/ADEDY and consequently the strikes that they call for? Their relation to union bureaucracy, in most cases, is either typical or totally non-existent. We believe that traditional unionism finds it extremely difficult, or is totally unable, to politically mediate these struggles right now. The majority of people struggling in their workplaces rarely expect anything from union federations or GSEE and surely do not find their real interests and needs represented there. These political structures represent a practical reference point for very few people any more. Nobody has seen such structures stand by their side and defend them, and even their clientelist role collapses, since with the continuous deepening of the capitalist crisis, union mediation becomes increasingly useless to employers. In the private sector, and especially amongst fields of precarious working conditions, where new subjects of struggle often carry experiences from student movements, from the December 08 riots and from the squares movement, bureaucratic unionism is not only scorned, but politically rejected. The phrase that encapsulates the key issues of the above-mentioned struggles is their “inability to link with each other”. But what does this “inability” practically mean? What internal contradictions of struggle does it highlight? For us, the difficulty in linking struggles relates to two main issues: on the one hand, the linking of different struggles, and on the other, the linking between “old” and “new” subjects participating in those struggles. As far as the first issue is concerned, we know that GSEE is unable to form a reference point for the connection between different struggles. But is there a possibility of an autonomous non-hierarchical struggle coordination? So far we have seen several workers’ struggles (in which we have also taken part in), getting defeated, becoming isolated and unable to relate to other subjects, coming either from similar working sectors or elsewhere. The movement milieu, despite organizing some solidarity campaigns for specific struggles, seems to be failing in becoming the link that would bring together different subjects of struggle. Any attempts for struggle coordination among workplaces so far have rarely succeeded in moving past mere declarations. In some cases they have ended up adding up lists of demands, empty of meaning (and hence incapable of action), while in other cases they have gotten tangled up in ideological labyrinths. In all cases however, the movement milieu has failed in becoming a reliable political power that would pose the question of autonomous coordination between struggles. The second issue concerning the difficulty of linking struggles concerns the relations between ‘old’ and ‘new’ subjects in workplaces, or even so in similar (or common) struggles. In our opinion, this is a key issue as well as an important cause of contradictions coming up in today’s struggles. By saying ‘old’ and ‘new’ subjects we are referring to those people, who although working side by side, they are doing so under different working conditions and are dealing differently with survival issues, hence choosing different forms of struggle. If we take, for example, the mobilizations taking place in municipalities, we will see on the one hand, permanent workers, who, seeing their salaries getting cut, and hovering between layoffs and suspensions, are protesting mainly through their traditional trade unions. On the other hand, there are public welfare workers, the ‘rented’ labor force, who are moving between unemployment and precarity, and are struggling through non-hierarchical platforms, against late or non- payment of wages, and against intensified working conditions. Although these subjects are taking part in mobilizations, the difficulty for them to meet with one-another is a big one. Something similar can be observed in the struggles taking place in universities. The contractor company employees do not seem able -so far- to effectively connect with students, who have traditionally mobilized inside universities. We believe that explaining the causes of this sort of inability of linking and finding the political concepts and organizational forms that would bring us all together is one of the most important (and strenuous) duties of the current period. Given those particular circumstances, the following questions emerge: Are individual struggles, effective? Can such struggles be victorious? Is there a need for a central political strategy in order meet the desired results? We surely cannot answer those questions in an absolute way. We have followed individual “small-scale” struggles, we have seen them win and we have also seen them lose. Despite their inability to link with each other, struggles continue to break out here and there. A big part of the Left (especially its extra-parliamentary offshoots) is attempting to “unify” different/dispersed struggles under an anti-austerity agenda. Another part (SYRIZA), takes this concept even further, insisting that the only prospect of an anti-austerity “unification” is to overthrow the government through elections. Radical movement strategy, however, is definitely in contrast with political manipulation and electoral politics. If we wish to put the issue of strategy in realistic terms, we have to explore the possibilities of linkinf different fields of struggle. Let’s take a look at the way communities of struggle are created in the field that production and reproduction come together: the everyday life of the cities’ neighborhoods. In recent years, neighborhood assemblies have come to be the most vibrant part of the movement. They came to life mainly after the December 2008 revolt, while they multiplied and gotten more massive through the Syntagma -and squares- occupation movement. Apart from the role that they played in central political events in the streets, they have also brought forward a number of issues regarding social reproduction of labor force, such as housing, food, healthcare, transport and electricity, and have done so by setting up autonomous structures of solidarity and struggle. Through the route those assemblies followed, they have managed to accomplish a number of things, giving an important boost to the movement of class antagonism. First of all, there has been a stabilization of the movement’s political presence in many neighborhoods, something that resulted in many more people gaining struggle experiences. The dynamics developed in those neighborhoods came to be more focused when they managed to put forward the issue of everyday needs in practical terms. Two characteristic examples of this are the following: the struggle against the property tax that was incorporated in the electricity bill (with militant protests in against the state-owned electrical company, as well as neighborhood networks of electricity re-connections in cases it was cutoff) and the stabilization and improvement of organizational structures concerning mutual aid (community kitchens, social clinics, free bazaars etc). The route that communities of struggle in neighborhoods have followed has, of course, contradictions of its own. During recent months, following a recession in central mobilizations, a lot of people have gotten disappointed, something that resulted in some assemblies losing their mass character, while others dissolving completely. Where does, however, this disappointment of “non-politicized people” lie? We believe that, on the one hand, assemblies have failed in addressing people’s needs in practical ways, while on the other hand, people, being used in indifference electoral politics rather than active participation, quickly lost faith in these assemblies. The fact that, in most cases, the people remaining active in those neighborhood assemblies are more or less the more “politicized” ones, has brought up once again a number of structural political inadequacies. Whether concerning the re-instatement of concrete ideological identities and ideological fortifications, or the return to more traditional forms of political action (e.g. emphasis on propaganda and activism, rather than on the creation of new social relations through solidarity and struggle), these inadequacies are highlighting the inability of many neighborhood assemblies to respond effectively in practical issues that are rising with the deepening of the capitalist crisis. The creation of such structures, although difficult, continues to raise the question of addressing specific social needs. We must admit, however, that “mutual-aid” structures have limits of their own. As the state increasingly withdraws from welfare services and social reproduction, a huge gap emerges. We believe that neighborhood assemblies, neither can nor should try to fill this gap, acting as a “welfare state” from the side of the movement. With the deepening of the crisis and the worsening of living conditions, we have to pose the question whether solidarity structures can be viable without militant struggles. Can community kitchens be a response to the rising prices in supermarkets? Can power-supply reconnection networks respond to rising electricity bills? Can social clinics respond to hospitals being shut down? At this moment, solidarity structures act as constitutive element of communities of struggle and are an important political tool in order to come together with other exploited and oppressed social groups. If, however, social solidarity is not combined with militant struggles, these mutual aid structures are at risk of becoming a way of sharing our own misery with each other – a form of self-management of poverty. So how do we respond to the issue of strategy? As stated at the beginning of this text, our conclusions are not final. They come as a result from our participation in the movement and the answers that we are called upon to give to the problems it currently faces. We seek to overcome the recession of the movement (and the frustration it causes) through the circulation and linking of struggles at workplaces and fields of social reproduction. The possibilities of such a linking arise in the fields where those struggles emerge in the first place, i.e. from the actual everyday needs of people taking part in them and the priorities generated from them. First, the struggle against the layoffs and the cessation of payments that employers have declared against employees. Second, the resistance against new forms of management, disciplining and fragmentation of labor force, where unemployment meets with precarity. Third, the creation of communities of struggle and solidarity in the field of social reproduction. Above, we grappled with the critique of the logic of the «Great Night», which prevailed in the general strikes, not recognizing strikes and demostrations as the ground where the struggles of our class coud be linked with each other. The continuation of this critique is looking for the objective potential and deficiencies of linking the dispersed struggles, their inherent tendencies to transcend the fragmentation that characterizes them, as well as the obstacles that such efforts encounter. We will try to define what we mean by the term “linking struggles”, trying to be as specific as possible and having the struggless we participate or know through experiences of comrades as a political compass. We are also stressing that we are part of some of the struggles and the organizational forms that we criticize, so this critique concerns also ourselves to a certain degree. Two years ago in the squares movement we saw people that opposed the capitalist restructuring policy of the Greek state trying to connect in a central way. This move attempted to overcome the struggles that were just following behind the general strikes, which were called by the trade union bureaucracy and the political parties in order to decompress the rage of the exploited. The movement tried to establish in a contradictory way its own stable spaces and times of confrontation: Many days and nights of occupied city centers giving the message that “we do not leave, if you do not leave”. Before the final eviction by the police, inside the squares movement there was a -not necessarily explicit– division: We focus our efforts into the political center of conflict (the Syntagma Square, the parliament the austerity measures) or unfold them in every part of our everyday life that is affected by the capitalist restructuring? We must recognize that the first concept highlighted the importance of creating a central political conflict to block the austerity policies: If we always lose and the capitalist restructuring is triumphing over our lives, the concept of «every man for himself» and the sense of collective weakness prevails. On the other hand, this logic brought up, once again, the issue of the «Great Night» that would unite “the people» against the «traitor politicians». This patriotic mentality illustrated our inability, as the working class, to perceive ourselves as a collective subject through our experiences of struggle. On the other hand, there was another mentality that did not want this interclass populist patriotic rhetoric to be the foundation of our common struggle. Instead, it suggested that we should come together through our common experiences and practices that emerged from the real activity of the people who occupied the squares. There was an attempt to decentralize these communities of struggle towards the terrain of our daily exploitation, in the workplaces, in the neighborhoods and in the streets. Linking struggles on the basis of everyday capacities and problems of the real relations among the exploited and not on an abstract strategic level, where the enemy prevails ideologically and militarily. This decentralization and diffusion of struggles is something that people have tried to do since the squares movement, since the material and ideological defeat of the first mentality. The number of existing collectivities, assemblies, aeras of struggle, strikes, self-organization and soilidarity structures that exist does not allow anyone to claim that «nothing is happening». What it certainly not happening is the creation of a strategy of linking struggles after the failure of the «Great Night» of the general strikes and the squares occupations. We are therefore doomed to suffer the «long night» of the ideology that dominates in periods of temporary downturn of the movement, the retreat of the exploited before going once again one step further in the history of their emancipation. It is usual in such miserable periods for ghosts from the past to re-appear (i.e. the unhistorical comparison with Greek/Spanish civil war), self-indulging generals without armies, or big plans of organizing a class war without the actual warriors, as well as the voluntarism to «switch on» the movement with ready-made leftist party initiatives (like the attempts to repeat the occupation of the Syntagma Square in March 2013). Such phenomena, despite the fact that they are claiming to attempt the unification of fragmented struggles, are mere symptoms of struggles’ inability to link with each other. We will come back to that later, but first we will attempt to focus on what we recognize as the basic problem: The objective fragmentation of our class, the quantitative and qualitative aspects of the communities of the struggle, their desire (or absence thereof) to connect with each other and the problems they face in attempting to realize their goals. Our starting point is a tradition of the movement of social antagonism which supports that politics are not separate from our everyday experience and action. For example, any fight for better wages in our workplaces is not a matter of individual interest conflict between two «equal before the law citizens» (employer and employee), but a political conflict around the power of capital over the production process. But also beyond the production of surplus value, the living conditions and personal relations among the workers, the unemployed, the housewives, the students, the immigrants, and also the struggles of all these in the field of reproduction, have a key role in the formation of political attitudes. This is where we must seek the potential of linking different struggles, in the characteristics of the space and time of exploitation, which are defined by the capital and the resistance of the proletariat, where communities of struggle (as well as divisions among the exploited) are born. And we argue that in the question of linking struggles, the subjective side of the resistance of the exploited weighs more than the seemingly unifying dimension of the universal attack of the bosses on the proletariat and the petit bourgeois. We don’t want to be united in an abstract level, which is set by the political strategy of the bosses, but on the basis of actual relations of struggle that we build every day in the here and now. What does this view entail today? Let’s take for example a very large part of the greek working class. The workers and pensioners of the public sector, who have been under a devastating attack during the past 3 years. Faced with this attack, they have reacted with a set of seperate struggles, sectoral strikes, as well as with the participation of a large part of them in the movement of the squares. Apart from general strikes and squares, the instances where we saw individual categories of employees of the public sector linking their struggles are very few. How can indeed the attack of the bosses be the only point of our unification, when all the previous decades the State-employer had set a status quo of integrating class antagonism into clientelist/corporatist frameworks? So what’s the case when the government is affirming that they don’t care anymore for preserving the previous status quo and the consequent political cost? We see, in the best of cases, that long-lasting strikes break out in sectors with significant economic costs for the circulation of capital, where at the same time it happens that there are union laeders not controlled by by the union bureaucracy of the social-democrats (PASKE) and the right-wing conservatives (DAKE) (eg subway workers). What are, however, the weapons of the strikers, when the State is affirming that any strike which implies economical cost will be suppressed under martial law? First, the determination of the strikers to take the conflict as far as possible by exhibiting characteristics of a determined community of struggle. Second, the ability to spread the struggle primarily to groups of employees with similar characteristics (eg bus drivers). The first one simply does not ever happen due to the characteristics of strikes in the public sector that have prevailed during the last decades: the public workers don’t go to work, declaring to the service that they have a time-off, not a strike, there are no meetings of the workers and no fighting fermentation, and they usually leave their struggle to the hands of bureaucrats, who declare that they will fight till the end and when the riot police arrive to end the strike, they start looking for holes to hide in. Even in the few cases where the possibility of a real (and therefore wildcat) strike seems tangible, as in the case of school teachers, once again, all the decisions were left in the hands of the bureaucrats. The second one is also undermined by the corporatism which has been cultivated for so many years on the basis of the clientelist status quo among the state, the union leaders and the workers. On the other hand, we witnessed the bus workers go on strike right after the subway workers’ strike was suppressed, which a sign that there are molecular tendencies of transcending the corporatistic tradition, which are nevertheless unable to make up for the lack of organizational forms and culture of autonomous struggle. If this is, in general, the present state of the level of connection of struggles in the public sector, how realistic is the possibility of linking the struggles of public and private sector workers and, even further, the struggles of workers with permanent working conditions and the struggles of precarious/unemployed/temporary workers? Between the first two categories there is the unifying element of the regulated labor under collective agreements (although this is something that the bosses want to change…) and a huge array of significant divisions: either because of the clientelist networks, which private sector workers don’t have access to, either due to the lack of forms of struggle to bring together the providers and users of public services (eg. free transportation of passengers during the subway workers’ strikes). As for the private sector workers, the corporatist mentality often takes the form of identifying themselves with the interests of the company they work for: «We accept the wage cuts, individual contracts, late payments, as long as the company stays afloat”. Even workers with the same employer often reproduce internal divisions and the “every man for himself» mentality (an example of this attitude of the “Halivourgia”steel company workers of Volos towards their -more undervalued within the same company- colleagues in Aspropyrgos1). We also witnessed spontaneous rank-and-file strikes in large workplaces such as IKEA2, where however there is a total lack of the tradition of industrial action that is able to halt employer terrorism. Finally, in the cases of the companies that went bunkrupt, where the workers demand the money that they have worked, we observed that either struggles are confined to the limits of a purely institutional/legal level of reduced effectiveness, or the corporatist logic prevails once again in the form of “self-management of the company”, like in the newspaper “Eleftherotipia”3. But there is also another trend: Either occupied working places (eg. TV station Alter4, factory of VIO.MET.5) where we can see the issue of the linking struggles addressed on a minor level, or cases of meetings umong unpaid and laid-off workers (like the case of the workers in the record store «Metropolis” and the workers in the publishing house “Liberi”6). As for the «new subject” of precarious/“claimants”/unemployed/temporary workers, it’s very difficult to imagine a community of interests with employees with permanent working conditions, since they are, to a large extent, excluded from labor laws and collective agreements. In many cases the unions of the permanent workers choose to exclude in a corporatist way the cheaper precarious workers in order to maintain their wage privileges, like in the post offices7 ,or in the case of the main trade union in Greece (GSEE), which had no problem to become the employer of tens of thousands of “claimants” in the first implementation of community service programs in Greece (2012-13). On the other hand, in these programs, we saw strikes of “claimants” for the salaries they were not paid every month, that were mildly supported by the unions of the public workers in municipalities, as we have seen, for example, the public workers of the Statistic Authority of Greece (ELSTAT) to stand by the young enumerators that were clashing with the cops in the cental offices of the Authority8. Such union coverage is, of course, useful, but it is in no way creating real interaction and connection between the two different subjects. In the case of community programs, there were also several communities of struggle demanding monthly salary and perceived themselves as “workers meeting permanent needs of the municipality/hospital” and not “recyclable unemployed workers working for 5 months in public services across Greece”. It is well understood that the precariousness at work is a de facto deterrent to the possibility of creating and linking stable communities of struggle. Generally speaking, the new work relations and the subsequent individualization generate even greater fragmentation of the modern working class. Finally, in the universities, as they are mass places where new subjects are formed and concentrated, the struggles remain trapped in the corporatistic contents and obsolete forms of traditional struggles about the “value of university degrees” (as in the student mobilizations against the educational reform law «Athena»9), that are completely at odds with the modern labor reality that follows or accompanies the increasing intensification of studies. If the modern labor characteristics are making it increasingly difficult to organize in trade unions and connect with other workers, what about the field of social reproduction, where there are no such objective difficulties, in the popular assemblies of the exploited in the neighborhoods? Despite the efforts of organizing collective payment refusal for state-provided services, it was difficult to transcend the mentality of people wanting other to solve their problems for them (like in the efforts of neighboorhood assemblies to reconnect electricity in the houses that couldn’t pay the bills10) and overcome the petite-bourgeois mentality that after all payment or non-payment is an individual issue concerning each person. What is even more difficult is for these practices to appeal to a lot of people if they fail to address the issue of what to do in case of state oppression. In some areas (notably to the more proletarized eastern and western districts of Athens) there was a more dynamic struggle against the tax that was incorporated in the electric bill, which also brought certain practical results (reconnections of electricity, ousting of contractors, collective non-payment in the local office of the state-owned electrical company). We also saw a regional coordination of the these mobilizations. Nevertheless, there was no perception of struggles as capable to lead to substantial changes in the everyday relationships and behaviors of the exploited against the state institutions; to produce, in other words, constituent power on a grassroots level. Speaking about constituent power we do not of course mean the judicial claims proceedings against the tax in order to be abolished by the higher courts, but to ensure a massive social support and justification in the non-payment action and to implement this decision despite the state repression. Such an anti-statist perception of struggles, that they are capable of conquering and keeping territories of social counter-power, is also the prerequisite to begin any attempt of militant organization of the exploited in the neighborhoods. To oppose the concept of “sharing our own poverty” or “we can do it together” that is promoted by NGOs, municipalities, the church, the media, etc. the unemployed, for example, who meet each other in self-organized spaces of mutual aid, should begin to discuss how they can succeed in not paying tickets for public transport or getting essential goods for their social reproduction from the super market by just showing their unemployment ID. In this sense, there is “production of law” when local communities object to the plans of degradation of nature and of their life by large construction projects of the capital, as in Keratea and in Chalkidiki11. The determination of such communities of struggle to impose by legal or illegal means their right, against the capital’s need to raise profits, is what places them in the centre of political conflict with the «zero tolerance» of the state of emergency. The nationwide solidarity expressed towards these struggles and against the state repression they face is definitely «sine qua non» for their success, but the logic of «solidarity campaign» limits the possibility of spreading the essence of the struggle in the territories of the rest of the exploited. In other words, we mean that it is always easier to carry on routine actions in solidarity of a emblematic central struggle than to highlight and link the content of such struggles with the ‘here’ and ‘now’ of the antagonisms underlying in every neighborhood. At the same time, the creation of communities of struggle of locals and immigrants in most cases is perceived as «thematic» solidarity whenever there is an instance of the brutal exploitation and repression the latter (eg. Manolada12, hunger strikes in the detention camps). Moreover, we see examples of struggle (like the assembly of immigrants and solidaires in ASOEE university13) that fully engage in this demanding and long-term process of creating relations of struggle with the «others» who live and fight right next to us. From all of the above we conclude that we rather lack the quality characteristics for the formation of communities of struggle on a solid base rather than the causes for clash or the eagerness to struggle in the various fields of social antagonism. It is not that the exploited masses are not “politically/revolutionarily conscious” but that they do lack in forms of organisation that may promote autonomous contents of struggle through which they may conquer the political hegemony in the social body they address. Apparently, once more, we are referring to a strenuous work of self-organisation and a change of the sovereign ideological correlations that are being reproduced based on social relations: “changing what we are”. The traditional political/organisational forms of linking struggles we know of are looking towards a completely different direction. They usually do not perceive the changes in the “technical composition”, the contemporary conditions of fragmentation of the body of the exploited and they look forward to their unification, as if by magic, as far as their demands are concerned – demands that do not, usually, correspond to the depth of the contents of struggle that come up. They perceive, as well as the majority of the exploited do, every single clash, now, as clearly political, since it leads to a clash with the totality of the choices based on the memorandum, made by the bosses. But they refuse to face the complicated nature of the actual conditions that make it hard to establish a connection among those who struggle and, by reversing causality, they consider the struggles not efficient because there is no “political consciousness”. They fail to see that many of the existing collectives, especially the unions, cannot make sense and lack in efficiency or creativity; they insist on the lack of a pure ideology, on the hegemony of a certain political aspect –or of one that is based on the function and goals of political parties– in the various fields of struggle. They say: “Struggles fail because there is no solid political conscience/organisation/front/party that collides with the totality of the choices made by the government/state/bosses. We are here specifically talking of the political project of the organisations of the left, latent to a part of the anarchist/anti-authoritarian movement (a leninist view of the “consciousness”, which is externally imposed on the struggles). Obviously, it is in the case of how the Greek Communist Party (KKE) controls the working mass of Worker’s Front for the Struggles [PAME (ΠΑΜΕ) / the representatives of the KKE in the unions] that we see the above model in action in its purest form. The Party makes sure to support –with the force that stems from its solid organisation– the important struggles in the fields –of the (traditional) working class– that it controls (exclusively). But at the same time, the Party practically “castrates” them on a bureaucratic level as it openly states that it does not really believe in victory unless its political views prevail on a central level. Moreover, by “central”, the Party does no longer mean “electoral”; They rather wish to maintain their party-control on the workers that are being affected and are still politically uncertain (they are by no means willing to deal directly with such a big crisis of capitalism). The workers, the Party believes, cannot make things progress; they can only accept the know-how of PAME, which has been –in certain cases– efficient. Thus, connecting the struggles means to establish a general consensus and to bring together various party-controlled committees to create an overall “popular front”. The majority, of the rest of the Left, functions in an even more grotesque way, since they are not related to the labor movement in the organised way PAME does. The extra-parliamentary Left has chosen to unite the syndicate parties it controls under one single formation, the “Coordination of Unions”, and to make open calls for a “working class/popular uprising” on Sundays at Syntagma square. The party-controlled committees of the Coalition of the Radical Left [SYRIZA (ΣΥΡΙΖΑ) / Governing party since January 2015], that can control nothing beyond their member parties, equally expect the resurrection of the movement of the squares, not in order to ensure the promotion of the demands set by the movement, that rose 2 years ago (2011), but to ensure even more votes than in the past elections, the ones that gave them the status of the opposition in the Greek parliament. Of course, the “inert” masses chose not to follow when such grotesque calls take place. A big part of the anarchist/antiauthoritarian milieu, that for the past 5-6 years has been active among the workers and the neighbourhood assemblies, spontaneously follows –unfortunately– similar leftist methods. Part of the grassroots unions and the workers’ collectives –where this particular political view is dominant– promote a unification, oranisation-wise, based on the model of a “panhellenic federation of grassroots unions”. This particular part of the workers’ movement has been constituted during the struggles that began, in the past years, as an attempt to address –for unionist purposes– the new model of the precarious/under-evaluated worker of the private sector and has given a series of small, yet important, struggles in its action-field. Its organisational force has been founded on workers that had been integrated in the broad anti-authoritarian movent, while the class content of its action was, largely, externally defined by an institutional frame that did not correspond to the contemporary intensified terms of work, imposed by the bosses. For example, we have given a series of struggles for the retraction of several dismissals after the participation of workers in general strikes, based on the legal frame for the protection of the state-supported syndicalism rather than on the actual will of our colleagues to hold a strike. The evocation of the legitimacy of our needs and of the illegal character of the actions of our bosses may, obviously, well be used as a tool but if it does not have the communities of struggle by its side, it will –sooner or later– lead to the dismissal of the most militant ones of the workers. Of course, the austerity memorandum (among other things) present the bosses with the option of discarding the previous “typical constitution” that defined the work relations. The result is that, while the grassroots unions lose the institutional ground of their coming together, they maintain the contents/forms of struggle that correspond to the previous technical/political composition of the working class. The only perspective that may allow them to break through this existential impasse would be to turn towards the process of creating, in the various workplaces, communities of struggle that would be based on the real collective power of the workers themselves. One has to search for organisational forms which correspond to the loss of shared labor identity (eg working in the same sector), to the workers’ precarity and to the flexibility of the working force. If, e.g., the individual labor contracts practically render every syndicalist demand a cause for dismissal, one should invent “illegal”, underground solidarity-based forms of struggle. The blurry line between work and unemployment (as is the case of “benefited” workers and benefits claimants – an institution established during past years that canalises unemployed young people to work for the public and private sector, getting paid with extremely low wages) creates the necessity/possibility to link struggles in the fields of social reproduction. During this last year we may see quite enough examples of workers’ struggles that have been supported by the neighbourhood assemblies (e.g. Chalyvourgiki, Phone Marketing, dismissal of workers – members of primary syndicates) – a practice that is open to this perspective. The prevalent strategy, though, when it comes to this part of the class movement is the “from above” unification of a minority of struggling workers under the, carefully hidden, anarchist political identity. The preferred organisational form is that of the assemblies, of “consensus” of a latent bureaucracy, common to the anarchist milieu as far as the taking of decisions is concerned. On the other hand, the political content of their interventions in the workers’ movement itself is mainly defined by abstract ideological motos (like “Revolution now! For the overthrowing of the parliamentary coup!”) and, in many cases, by the current agenta of the anarchist milieu itself. Whether we want it or not, such a strategy is capable of uniting only the workers close to this political view. Although the self-organised/popular neighbourhood assemblies were built on the optimism of the same cycle of struggles (starting from December 2008 and the square occupations, later on) and were developed in conditions that could, without a doubt, promote the struggle of the movement against the state and the capital, they face similar problems as far as ideologies and polital party mentalities are concerned. In Attica, a region we know well, there were two important efforts for the linking of struggles: the coordinating assembly for action in Public Transportations during 2010-2011 and the coordinating assembly of the neighbourhood assemblies [more than forty assemblies participated in its first gathering in Panteion University, after the square occupations movement (2011-2012)]. The first one was an important effort to connect a struggle in the field of social reproduction (refusal to pay for tickets) with a struggle in the field of production (strikes in the Public Transportation). The activism of this coordinating assembly (mainly the sabotaging of the ticket-validating devices and the aggressing of ticket controllers) did openly suggest practical ways of mass disobedience; but it was not broadly adopted by the passengers. At the same time, inside the coordinating assembly, a big ideological debate was taking place, regarding the public or free character of the public transportations in an ideal society, leaving aside the essence of the struggle itself, that is the raising of the cost of tickets that was, finallly, imposed. In the case of the coordinating assembly of the neighbourhood assemblies, after the movement of the square occupations, the conditions of the connection among territorialized collectives, with a practical view on things, were initially good but things got tougher due to various external difficulties and political contradictions. We will try to sum up these difficulties and contradictions to three crucial points: the political composition of the assemblies, the question of the process itself and the dialectical relation between central and local activism. Already from the early stages of the coordinating process in Panteion, it was obvious that the body of assemblies was less homogenous than it had initially appeared to be. The differences regarding the political composition of the assemblies stemmed from the experience accumulated during the struggles as well as from the issues with which each assembly was preoccupied. The neighbourhood assmblies born during the uprising of December 2008 and the struggles for free open-air spaces in the urban environment had different characteristics compared with the assemblies that were born during the summer of 2011 in the squares of the neighbourhoods of Athens. Even when it came to square assemblies, though, the distinction –between these whose practices were closer to those of the anti-authoritarian movement and these that were closer to the left– showcased many issues regarding the forms of political conflict among the assemblies and inside them. This kind of contradictions in the political composition of the assemblies is being reflected on the way they faced the issue of the coordination process. The fact that each assembly functioned differently than the the others demonstrated the distinction between these that sent representatives (who conveyed the decisions of their assemblies and went back to them to inform the others) and these that sent delegates (who were authorised to make decisions, on behalf of all of the assembly, on the spot). On top of that, the lack of a “public-discussion culture” lead to a problematic meeting of collective and individual arguments to the extent that, after the initial informative speeches of each assembly, the process would often end up in long personal speeches of some of the participants. It was the diffidence as well as the thoughtlessness that prevented the whole process from becoming a solid and effective structure that would play a decisive role in things. Finally, the question of practice became a field of opposition between two different mentalities regarding the interaction between local assemblies and the central coordinating assembly: would it be better to organise actions centrally, based on the decisions of the body of the assemblies or to let the local communities of struggle converge on specific issues? Given that the process failed to resolve this contradiction, they never managed to actualy benefit from the richness of the already existing experiences of struggles –acquired by the de-centralised networks of assemblies [e.g. the interventions and actions towards the Electricity Company [DEΙ (ΔΕΗ)] or the hospitals]. In the end, the only common action of the assemblies of Panteion was their organised presence in the march of February 12. From that point on, the process passed very fast from the stages of de-massification, of degeneration and of a turn towards a coordination based on common political characteristics. What do the terms “linking struggles” and “autonomy of struggles” imply? In the paragraphs above, we went through the existing initiatives of linking different struggles and we examined their shortcomings. We referred extensively on how today’s reality has shaped the landscape of struggles both at the workplace and in the neighbourhoods. Now, it’s time to step a bit further: how do we interpret the term “linking struggles” at present? Well, for us this concept implies a connection of communities of struggle and it refers to something broader than the relationships of the political milieu that participates in them. This activity of connecting struggle communities is, essentially, an act of composing our class. The connection of such communities involves communication, socializing and exchange of struggles’ experiences in topics of common interest. This relationship does not simply refer to the coordination of the politicized or the syndicates14. Moreover, it is certainly not referring to the generic and abstract political discourse over ideological frameworks that will amalgamate a political form for connecting struggles; frameworks that come together without the participation of the social subjects of a struggle or without taking into account the (lack of) rhizome in social spaces or even the (non-)existence of struggle conditions. In our eyes then, it is evident that prior to attempting to participate in the process of connecting struggles, it is imperative for political subjects to realize the significance of it, i.e. to evaluate and identify the current state of play: when struggles remain isolated, they are also going to be defeated. Essentially, this implies that political initiatives during a struggle should be triggered with a theoretical and practical preparation that focuses on promoting dialogue and helps to jointly shape practical outcomes; imposing an ideological platform over a struggle’s needs or its difficulties is, unavoidably, a short-sighted strategy. We can’t afford to forget that it is Capital that pursues our fragmentation and our division, seeking to turn one against the other. In return, the concept of linking struggles should be our strategic response to Capital. A two-folded response: on one hand new areas of conflict will surface through this process, on the other hand the subjectivity that participates in these struggles will emerge. This necessitates, additionally, that specific issues at stake are present in a struggle. That is because the described connection occurs de facto within the process of a struggle: when the exploited undertake a protagonistic role. Since it is only then that the non-politically organized workers or unemployed individuals understand in practice, and not in ideological terms, the need of supporting their struggle; thus taking steps to attempt a connection with participants of another struggle. In other words, for the antagonistic subjectivity the connection of their struggle is not a matter of principles (and ideology), but a practical need, like all social problems: we are willing to connect with other people that face the same problems as we do; to fight and stand together in better terms. This of course does not imply that there shouldn’t be communication between political subjects prior the struggle’s outbreak, but rather that this established channel gains a true meaning within the struggle; when, instead of abstract political discussions, real and practical problems are being confronted. That is exactly why we talk about connection of communities of struggle and not for bringing together political / syndicalist leaderships. In this context, we should recall the example of the canteen employees in AUTH15’, who connected with the students’ demand for unrestricted access to meals, i.e. without the requirement to present their student ID card. The connection of these two communities triggered dynamics that managed to meet the demands of both collective subjects. In addition, there is another cause that brings struggles together and encompases practical effects to their collectives. It is well known that during a movement’s recession, political and social collectives tend to work on abstract and generic topics. This is not always happening intentionally, but is driven also by challenging circumstances: the lack of upcoming social struggles within the previous year had a devastating outcome, it breeded our defeatism that eventually crushed (almost) all of the social and political processes existing. Therefore, a self-preservatory activity seems self-evident. Even if the concept of linking struggles, i.e. the endeavour for the re-composition of the working class, has been a focal point of the movement of social antagonism, it must be admitted that the transformation of social relations we are experiencing in the past three years (as well as the means that the political milieu employs to pursue the movement’s expansion) make this concept a field of discourse and a practice that needs to be re-invented. For instance, the idea of establishing a relationship between the public services workers in struggle and the actual users of those services is not new to the revolutionary theory. Especially in today’s landscape of welfare state dissolution, this struggle paradigm becomes more meaningful than ever. Quite frequently, we learn about joint initiatives of health workers and patients that struggle for maintaining access to a health center or eliminating fees and other access restrictions applied to health services. We should encourage and strengthen such struggles and act towards their proliferation. For us these are the actual processes capable of producing radical politics that challenge the capitalist state of things. By accumulating victories in each respective field, confidence is built within the class. And as such, the significance of this struggle paradigm becomes substantial on reinventing social emancipation. Beyond the abstractions that ideology imposes, we have to acknowledge the degradation of previous attempts on linking struggles and experiment on new approaches. For instance, if we observe that less and less unemployed people are queuing up in OAED’s16 departments, or participate in downtown Athens demos, then we should discover new paths of connecting and communicating with this subject. A step towards this direction could refer to the prospects of struggles in the squares and the neighborhoods: if we are to return there, we should examine having an agenda that focuses on fulfilling the participants’ needs and desires. Up to now we discussed what the term “linking struggles” means to us, but still we didn’t specify on which struggles we are referring to. Since it is important for us to be specific, we wish to point out the struggles that we are interested in participating and bringing together. When we talk about connection of struggles we think of autonomous struggles. Struggles that ensure the social subjects’ autonomy from institutional mediations: the intervention of the bureaucratic union, the party, media, local leaders, etc. That kind of struggles build their autonomy by denying Capital’s ideology and by rejecting its organizational forms, decision making norms (e.g. hierarchy, capitalist division of labor, etc. ), and, subsequently, the respective contents and core values (e.g. productivity-based salaries, hierarchical compensation, performance-related pay, etc.). That is a matter of great discussion which, while we can’t have it now, we can though clarify: being autonomous from mediations implies that (as participants of a struggle) we do recognize and realize the various roles, purposes and limitations of each mediation and, where possible, we pursue their elimination. Naturally, that’s a precondition for class autonomy and an objective for the movement of social antagonism. However, here is when someone needs to be cautious. That is because the conditions and the context in which a struggle breaks out nowadays do not allow purity in its form and content. Truth be told, this was always the state of play, if we exclude eras of revolutionary turmoil. While it may seem strange, struggles that embrace the aforementioned characteristics are emerging quite regularly today. However, in order for us to be in position to identify them we have to widen our point of view and not only focus on initiatives happening in Exarchia by our ideological acquaintances. So, the matter in hand here is to sharpen our ability to recognize the emergence of social antagonism. In summary, we like to think of the concept of linking struggles not as trivial as a coexistence of struggles’ representatives at a central political level can be; conversely, we understand it in a dialectic relationship to struggles’ autonomy. An autonomy rooted in a struggle’s contents and forms, which fights back on Capital’s ideological hegemony in the social relations we engage in. This perspective certainly applies to assemblies that circulate experiences, struggle paradigms and decisively act in the interests of our class. If we are optimistic, it is only because we are in place to recognize weaknesses in the projects we are involved in and, thus, we do consider the possibility of overcoming them. When we stand self-critically to the failures of the past political forms, we can expect more from the struggles of tomorrow. 1 The strike of the steelworkers of the “Elliniki Halivourgia” was the most important strike in the private sector during this period of struggles (2010-2012). The strike at the factory of Aspropyrgos started on 31/10/2011 and lasted for 9 months, until July 2012 when the right-wing government of A. Samaras sent the cops to reoccupy the factory. The workers were reacting to the dismissal of 50 of their colleagues and the conversion of their employment contracts from full to part time with simultaneous wage cuts up to 40%. The boss of the company continued the production via the factory of Volos. The strike received a huge wave of political and financial solitarity from the movement against austerity and the popular assemblies in the neighbourhoods, even though it was controlled by PAME, the union of the Communist Party (KKE), which tried to confine the strike to its stalinist politics. 2 At November of 2012 the workers of IKEA organized a 48hour strike against the conversion of their sectoral agreements in private and the consequent wage cuts. The Greek and immigrants workers were not controlled by any party or trade union, but after two days they stopped. 3 The newspaper Eleftherotipia (meaning “Freedom of press”) was one of the main newspapers in Greece all the previous decades, politically aiming to the socialdemocratic and left audience. After the crisis, when the owner started not to pay the salaries of the workers, the latter went on strike and even published two issues themselves during the strike (2012). But, soon, a big part of the journalists dropped out the struggle in order to create a new cooperative company, which published a “self-managed” newspaper named “Newspaper of the Editors”, politically aiming to the left anti-austerity audience. The newspaper is now supporting the government of SYRIZA. 4 During November 2011 the TV station “Alter” was occupied by the workers after the company went bankrupt. The unpaid workers, for a few months, were broadcasting messages of solidarity towards other workers struggles. 5 VIO.MET. is a factory (producing chemical products for household use) in North Greece that was occupied by its workers, after the boss left. The union of the workers has as main slogan “If you can’t, we can” and is politically close to the anticapitalistic movement and is inspired by the occupied workplaces in Argentina after the revolt of 2001. The factory is now working as a cooperative company recognized by a law of the state. 6 The record store «Metropolis” went bankrupt in 2012, leaving many laid-off workers demanding theirs wages and severance payments. About 50 of them formed a collective that organized a lot of actions against the new business projects of their former employer. The laid-off workers cooperated with grassroots unions in Athens and also called a common meeting with the former workers of “Liberi”, who had a similar bankruptcy story. 7 Many post office workers are working with 8-month contracts with the minimum wage (490 euros), something that is accepted by the union of workers in post offices (P.O.S.T.-ELTA) in the negotiations with the employers, in order to maintain the sectoral contract officials on the same salary levels. 8 Ten of thousands of young people and unemployed workers worked in the census of 2011 and waited a lot of months to get paid. They organized demos and occupations of the offices of ELSTAT in three cities. In Athens they clashed with the cops in order to invade the building. A short period after this struggle, they were paid. It was one of the more characteristic examples of victorious struggles of precarious workers in Greece. 9 The low «Athena», which was voted in August 2011, was another educational reform effort, trying to connect the universities with the free market, privitizing and making them more expensive for students, and changing “regressive” regulations, like the one was prohibitting the police from entering university spaces. Against this low occurred occupations of university schools in September-October, that in contrary with that happened with the student moovement of 2006-07 failed to win. 10 In 2011 there was a new law that forced house-owners (a large part of Greek society) to pay large taxes via the electricity bills (the abolishment of this law was one from the main campaign promises of SYRIZA). The neighboorhood assemblies organized various mobilizations aiming to the collective refusal of payments, but the majority of the Greek society didn’t follow. 11 Keratea is a suburb of Athens, where the local community rose up (in 2010) against the state plans to create a Sanitary Landfill in the region. A lot of violent clashes with the police erupted and the inhabitants used molotov cotails to defend their area. Their militant struggle received various forms of solidarity from the greek society and finally won. Chalikidiki is a region near Thessaloniki, where a private company (“Hellas Gold”, owned 95% by the Canadian multinational Eldorado Gold and 5% by Aktor, a construction company owned by the contractor Bobolas, who is one of the main contractors to undertake most of the major state construction projects) wants to create an open goldmine in the area of Skouries, destroying the nearby forest and the enviroment. The local communities there have also organized a militant struggle and a lot of protestors have been charged with anti-terrorist charges because of sabotage actions against a construction site of the company. 13 The “assembly of immigrants and solidaires in ASOEE university” was an assembly of both African/Asian immigrants and Greeks, aiming to defend the immigrant peddlers that were selling illegal commodities, outside the university, which is placed in the centre of Athens near the areas that many immigrants live. Very often the cops would chase the immigrant peddlers in order to arrest them and stop the illegal trade, and as many times the peddlers, together with antiauthoritorian students, would defend themselves by clashing with the police.